It’s hard to believe it was just yesterday that Jesse Eisenberg published his controversial piece “An Honest Film Review” in The New Yorker. Unsurprisingly, his portrayal of a bitter, vindictive film critic struck a nerve in the critical community, although reaction was varied. Some were annoyed, while others appeared to shrug it off. The clever ones got revenge by using their critical talents to impugn Eisenberg’s writing ability. But I had a different reaction. I was shaken by it. Injured, even. It was painful to read in one of my favorite publications a hateful, unfunny caricature of the work that I love, a passion that I have sacrificed much to pursue. I spent the morning on Twitter, surprised to find so few of my fellow critics similarly upset by it. Although Eisenberg’s words stung, the lack of sympathy from the critical community hurt even more. Eventually, I logged off and spent the rest of the day trying not to think about it, but it gnawed at me all day. Then I had a miraculous revelation that made everything better. Eisenberg’s piece wasn’t about film critics at all. It was about himself, even if he didn’t know it. Consider the character he has created: HIs film critic is lonely and isolated, unable to make any sort of connection with his fellow humans. He refers to the publicist at his screening as a “studio girl,” reducing her to a sexual object, but he still doesn’t have the nerve to speak to her. He tries to talk to another critic during the screening, but he is intimidated and embarrassed by the critic’s reference to a classic film he’s never seen. He’s professionally unsuccessful – logging only “845 unique views” a month on his blog – and unfulfilled. He’s embittered, angry, and alone. In other words, he is the same character Eisenberg has spent his career playing. The awkward virgin in his debut film Roger Dodger. 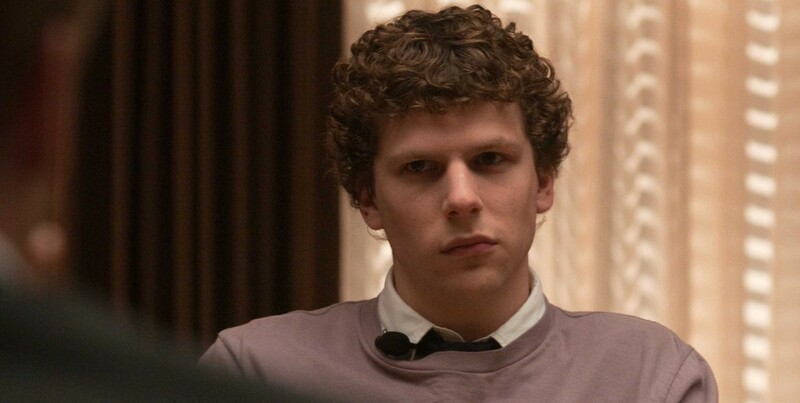 The jilted computer nerd in The Social Network. The jealous, petty writer in The End of the Tour. Put these characters together, and you might have something like the protagonist of “An Honest Film Review.” Since Eisenberg gravitates towards these type of characters – in all facets of his art – how could it not, at least in some fundamental way, be Eisenberg himself? Maybe his supposed satire of film critics tells us far more about himself than it does about us. To his credit, Eisenberg is at least partially aware of this. During an interview with Chicago Tribune reporter Mark Caro yesterday, he said, “I have elements of that guy, I suppose. Why else would I put myself out there so much, if I didn’t think that my thoughts should be on paper? I have that narcissistic element, or self-importance, or whatever.” Although it doesn’t read this way, he was nervous and rambling as he gave this answer (I didn’t transcribe every “uh” and throat-clearing), giving off the impression that he hadn’t given it much thought, and that his mouth was perhaps speaking a truth that his brain hadn’t quite comprehended yet. Although maybe nervousness made it seem more shrugged-off than it was. At least, he clearly has some level of awareness about how the character he is criticizing comes from a personal place, and that his judgment of this imaginary film critic is in some way an expression of his own insecurity and self-doubt. And yet, he told another story during the interview that shows how far he has to go. It was about the awful piece of criticism that inspired his piece, a poor review of Woody Allen’s latest film in which the writer zinged Woody for his famously frantic filmmaking pace. Eisenberg assumed the critic was “not criticizing the movie [but] his own lack of productivity.” That’s quite a jump, but even if he is correct, it’s ironic that the actor can spot such hypocrisy in others but, apparently, not in his own work. Unless you think “An Honest Film Review” is a clever piece of self-criticism, in which case Eisenberg is a far better writer than we’ve been giving him credit for. I’m sure you’d like to think he was writing about himself. For your own mental health, don’t do a Twitter search for “Eisenberg” right now. Ooh, an “I’m rubber and you’re glue!” defense. EVERY SINGLE profession, from janitor to CEO, gets satirized -often viciously- in culture at some point, and you rarely see this kind of response. The only conclusion I can draw from the number of traumatized online film critics in the last few days is that they know, deep in their hearts, that theirs is not a real job. It’s hard to believe it was just yesterday that Noah Gittell imploded because an actor posted a joke article about Jeff Wells and bad NYC film critics. He will be missed. In twenty years, we will learn that this essay was really about Warren Beatty. Yeah, film critics are widely thought of as “kill joys.” They just go in, dislike a film that audiences love out of sheer boredom. Critics – you’ve seen so many films, how can you enjoy it any longer and why take a giant poop on our enjoyment? We work 50, 60 hours a week, commute, strive and wish we were at the movies. For the majority of us, it’s an escape – you live in the escape and whine about it. “It takes more courage to create than to critique!” Just remember that the next time you hate a film that 80% of audiences adore. We’ll just keep having the fun you’re too cool to have, K? They seem to hate competence and want everything to be incredibly new and innovative. You’ve hit on something really important. People have pointed out a wide variety biases in the flim critics community; we’re largely male, white, and straight, and of course this will influence our perception of a film. I can’t speak for other critics, but I work hard to overcome these biases as best I can. The “originality” bias is a tougher nut to crack. We see so many movies in a year (one critic I know claims to see around 500!) that we inevitably value those works that do something – anything – different. For us, it’s only “escapism” when we have something truly stimulating to escape into, and those films rarely seem to dovetail with the ones that are best-liked by the public. I don’t say any of this to defend myself, or any other critic out there. If recent events have taught me anything, it’s that I don’t represent the critical community as a whole. But I thought it might be interesting for you to know where I’m coming from.